A 19-year-old has been arrested after a Chihuahua dog was swung around a man's head while on a walk. The man, from Welwyn Garden City, is being held on suspicion of causing unnecessary suffering to an animal. Hertfordshire Police confirmed the incident happened on Thursday at about 18:00 BST in Stevenage. Police said the owner of the dog had no idea of what had happened to it until a video of the incident was placed on Facebook. 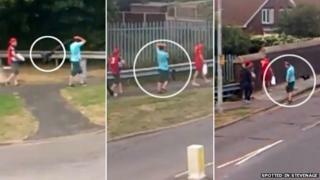 The editor of the Spotted in Stevenage site, which ran the video, said: "I am glad [an arrest has been made] in this short space of time through my page and with the help of the community of Stevenage coming together by sharing the video from my page." The video was shared more than 2,800 times with contributors commenting the act was "disgusting" and "appalling". RSPCA Inspector Stephen Reeves said the animal protection charity was "very concerned about this footage of someone swinging a Chihuahua around on a lead". "This would likely have caused the animal great distress as well as potentially serious injury," he said. "We urge people to remember that they have a legal and moral responsibility to ensure animals in their care are properly looked after, free of suffering, with all their needs catered for."